Dave Conley was awarded the 2007 Bid Calling Champion. 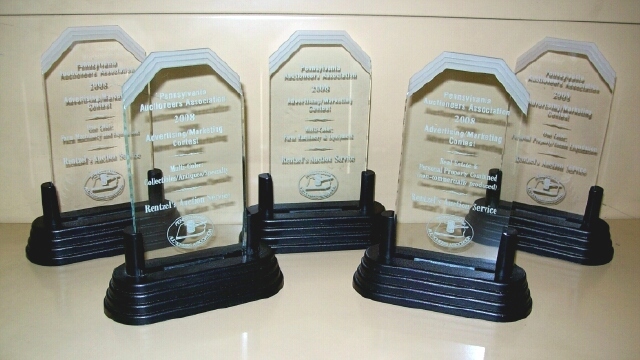 Rentzel's Auction comes up a big winner in the 2008 PAA Advertising and Marketing Contest. marketing methods of Public Auctions. Although Dave Conley won the coveted competition at the state convention to be named PA Bid-Calling Champion of the Year, the honor pales in comparison to the everyday delight he experiences. "I love to get up every morning and go to work," he said. It's a dream come true for Conley who aspired to become an auctioneer since he was a teenager. The opportunity to make a living at a job he loves continues to amaze him. Conley has lots of fond childhood memories accompanying his dad and grandfather to farm auctions. That was pleasure, a day off from farm work and chores. So the opportunity to get paid for similar days every day is like going on vacation. He still thrives on selling farm-related merchandise. Nonetheless, Conley said, people would be amazed to see all the hard work behind the scenes to make an auction a success. Procuring auctions, signing contracts, photographing merchandise to and preparing for advertising are some of the duties involved. "People often think auctioneers only work the day of the auction. They would be surprised how many long hours we put in preparing for it." he said. Real estate auctions continue to grow in popularity. Conley thinks that equipment that is power washed and buildings that are clean inside and outside give a better presentation and entices more buyer interest. "You don't need to put a new kitchen in a house or even paint it, but it should be neat and clean," he said. Conley attended the Reppert's School of Auctioneering in Illinois to learn the chant and general skills. The following year he attended auctioneer classes at Harrisburg Area Community College and passed the state test to receive licensing. He worked part time for Rentzel's Auction before going full-time seven years ago. He recalls one of the highlights of auctions was helping to prepare for his grandfather's auction in 2005 when he sold a Hit and Miss engine his grandfather recalled paying $60 for during the 1960's. It sold at auction for $25,000. Such spectacular profits are rare, but it's part of what entices the crowd. "There's something exciting about a live public auction that online auctions can't replace, " Conley said. "It's the chance of getting a bargain and the exciting possibility of watching an item be sold way above the expected price." "Old toys are in demand and draw large interest and good prices. There's plenty out there that remind people of their childhood and they want it." He's preparing to sell one person's collection of 65 pedal tractors. Conley, himself, collects antique advertising that is farm related. Conley and his wife, Amiee, have two children, Noah and Gracie.